When you are a picker sometimes a find can be worth more than originally expected. This past week I was offered a small library of military books from the estate of a former career military officer. Normally, I will not invest too much into books since they are not big sellers. However, if I can find certain military books at a good price, I will buy the entire lot for what I know will sell and take my chances on the rest. As I was thumbing through the books, I found papers with various notes. The former owner did not like writing in the book. Rather, he would write his notes on papers and leave them between the pages. He would also use different objects as bookmarks. I found everything from business cards to old identification cards. And not just his identification card. There were cards from other people along with a lot of black and white pictures. Since the books were handed down from his father, there were a number of early editions, especially books about Germany and Europe leading up to World War II. His father may have been an analyst since there were papers with insight beyond the written pages. I will be looking to donate some of this to a university or museum for them to study. But I did find something numismatic between the pages. 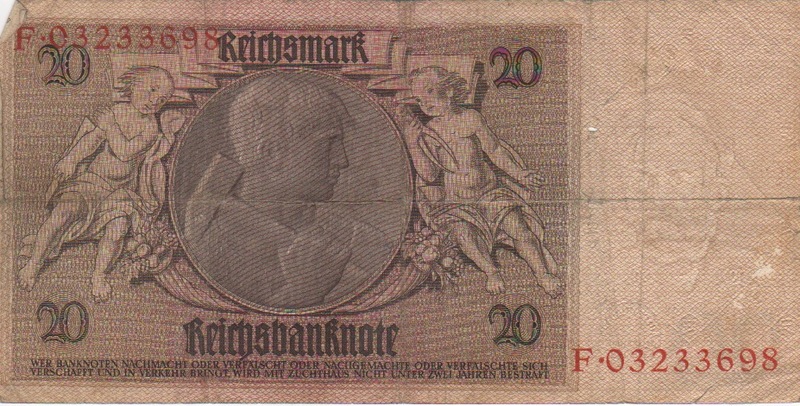 A 20 Reichsmark Bank Note from January 22, 1929. 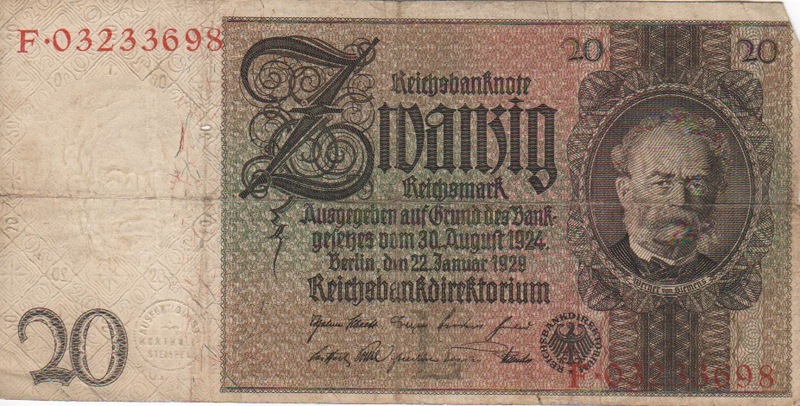 In trying to learn more about the note, the front has a portrait of Ernst Werner von Siemens, the founder of the electrical and telecommunications company Siemens. In other words, there is a minimum of a two-year sentence for counterfeiting this note. Although a cool find, this is not the type of item that would fit into my collection. I am likely to sell it to the next collector.